Santa Maria crater, about 295 feet (90 meters) wide, dominates the scene in this 360-degree view from NASA's Mars rover Opportunity, taken on Dec. 16, 2010. 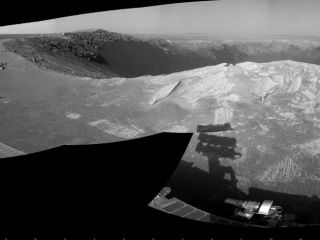 Opportunity used its navigation camera to take the frames combined into this mosaic. South is at the center. North is at both ends. The view is presented as a cylindrical projection.